The most inspirational entrepreneurial stories involve people overcoming hardships and succeeding despite the odds. Rags-to-riches stories have existed since businesses first came into existence, but they still never fail to strike a chord among budding entrepreneurs about to take the leap. One of the most recent booming startup successes presents such a story and serves to inspire, educate, and encourage young hopefuls looking to start their own businesses. When founders of Airbnb, Brian Chesky, Nathan Blecharczyk, and Joe Gebbia, first moved to San Francisco, California, they couldn’t afford rent for their expensive San Francisco apartment. Needing extra money, they rented out their living room bed-and-breakfast style to a few friends who couldn’t book a hotel room in time for an event. This sparked the idea to create an app that would allow people to find accommodation around the world, using other people’s available space – be it a mother-in-law suite, a guest bedroom, or even a couch. Airbnb would present a cheaper option for staying abroad than a typical lodging place, and in theory would give traveling options to people who otherwise couldn’t afford it. The idea manifested itself in their minds and grew into what we know today as the website that serves as the everyday traveler’s ticket to exploring the world. But before it revolutionized modern traveling, it was just an idea with no funding to back it. This limited edition “collectors’ items” generated more than $30,000 in sales. The roommates used this money to jumpstart Airbnb, putting it towards startup costs such as the design of their website, marketing campaigns and licensing. The money they raised worked to get Airbnb off the ground, but the three entrepreneurs were far from being in the clear. After its initial launch, Airbnb took a turn for the worst, as so many startups do. The brand wasn’t creating a lot of buzzes or getting enough publicity, and its revenue soon flatlined at only $200 per week – an amount that was losing them money after costs of production and a three-way split between each founder. Investors weren’t willing to touch the fledgling business, and the trio was forced to max out their credit cards to keep their idea afloat. Finally, Airbnb gained footing and convinced the co-founder of Y Combinator, Paul Graham, to fund their idea – a $20,000 investment that opened the doors to get more investors. They soon attracted a $600,000 investment from two other investors and were soon on their way to getting off the ground for good. But not everyone was convinced – Fred Wilson from Union Square Ventures famously turned down an investment opportunity, a mistake he later admitted regretting. The difficulties didn’t end with finding funding, however. Airbnb underwent a series of safety concerns sparked by a user whose home had been robbed by an Airbnb guest. This scare set the business back and resulted in hundreds of users who stopped using the service, afraid of the same thing happening to them. Airbnb and its investors struggled to find a solution to this issue and came up with a variety of ways to avoid disasters in the future, listed today on their Safety FAQs page. Their solutions include identification verifications, a profile, and review system for users, and protecting users with a Host Guarantee program insuring guests up to $1,000,000 in damages. 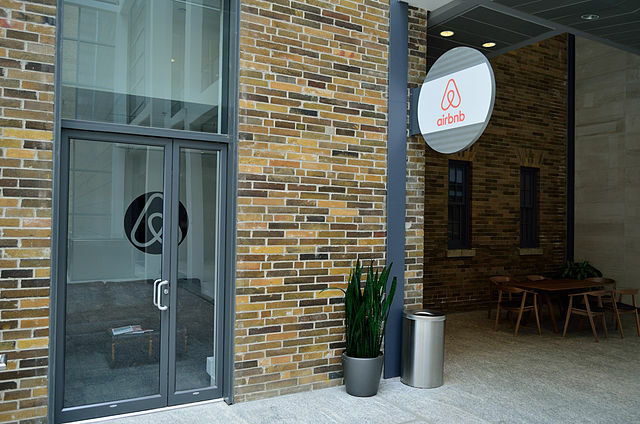 After covering all of its bases, the founders could focus on introducing the masses to Airbnb. Their strategy was a risky one, but it resulted in a high payout: they used Craigslist, an already-popular housing site, to advertise their own business. They were aware that Craigslist had their ideal target audience – people who were looking for accommodations other than hotels when they traveled. Airbnb executed a complex strategic maneuver that essentially placed hooks throughout Craigslist that directed the user to their website, instead. Since Airbnb provided better photos, more in-depth property descriptions, and a more personal nature, most people who were led to the site began to use it instead of Craigslist in the future. This campaign strategy pushed tons of traffic to Airbnb and drastically aided in its large-scale success. After Airbnb began to grow its audience, the founders started to brainstorm ways of making their site even more popular. They decided to expand the website’s reach to cities around the world, and also started to spread its capabilities beyond simply housing. They wanted to help the user through every stage of traveling and began to alter the focus of their website from providing cheap housing to being an all-inclusive hospitality service. Brian Chesky was especially behind this initiative, fueled by his desire to turn Airbnb into a place of upstanding customer service. The company started two new programs, called Neighborhoods and Local Lounges, to show users the surrounding area of the location they were interested in, using photographs and city mapping that showcased the beauty and hidden gems but still strived to depict the city honestly. These programs fueled Airbnb’s already-established platform for being a site for people who want an authentic experience abroad and continue to increase Airbnb’s overall attraction for customers today. Today, Airbnb is worth an estimated $25 billion dollars, catering to over 60 million guests over 190 countries. Their success can largely be attributed to their brilliant website design techniques, the determination not to quit in the face of hardship, and outside-of-the-box entrepreneurial thinking. The founders of Airbnb may have done some risky things, but their unique strategy ultimately paid off for them. But their story isn’t alone in its startup success, and there are techniques the everyday entrepreneur can learn and adapt from Airbnb to fit their own needs. The first thing Airbnb did right was to think of their customers first. Airbnb was never just a way to gain a profit for its three founders; it began as a way to revolutionize traveling for those who needed a new alternative. Through its eight years of business, Airbnb has continued to put the customer’s needs first, designing its website to be as simple and clean as possible. They exceeded competition like Priceline by enhancing the usability of their site, making it look more modern and cutting out unnecessary page fillers. The second factor that differentiated Airbnb from other startups was that they created their own niche within an already-established (but stagnant) industry. Craigslist was already a prominent site that was already offering users accommodation options other than hotels – but the founders of Airbnb didn’t let that stop them. Instead of becoming discouraged, they learned about what Craigslist lacked (such as high-quality photos) and built Airbnb to fill these missing needs. They continually sought ways to make their brand stand out from the rest, such as offering a maid service to users. Finally, the founders of Airbnb didn’t give up too soon. They took the bad news in stride and turned their failures into fuel for their future success. They did whatever they had to do to get their idea up and running, and didn’t stop when investors said no. Being an entrepreneur will always involve risks and difficulties. It’s how you react to these problems that make you stand out from the rest and marks your path to success. Great example, it is really very knowledgeable. Thank you for sharing.